The company produced 22.1 million barrels of oil equivalent (MMboe) across its operations in the quarter for sales revenue of $1.08 billion. Coleman said since starting operations at North West Shelf (NWS) offshore Western Australia last month, the Chevron-operated Wheatstone Train 2 achieved high production rates, building on the success of Train 1. The construction of Wheatstone’s domestic gas plant is around 90 per cent complete and is expected to begin operations in the second half of 2018. 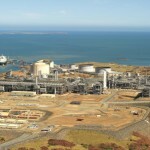 Chevron made its first LNG shipment from the Wheatstone project last November, a cargo delivery to energy company JERA in Japan. The $US34 billion ($46 billion) Wheatstone joint venture is majority-owned by Chevron (64.16 per cent). Woodside owns 13 per cent of the two-train project. Wheatstone’s ramp up, along with oil and gas deliveries from Woodside’s Greater Enfield and Greater Western Flank Phase 2 developments, is expected to contribute to a 100MMboe production target in 2020. For point of comparison, the company achieved 61.7MMboe in 2017. Woodside’s quarterly report also included the performance of the Pluto LNG JV and acceleration of the in-development Scarborough project. 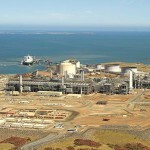 The company holds a 90 per cent stake in the Pluto LNG project in the Northern Carnarvon Basin. Coleman said the site provided “an outstanding result for the quarter” by achieving 100 per cent reliability and an annual production rate of 5.2Mt.